Nick also gained national social media attention when he and his partner decided it was safest to stay in their 12th floor apartment in lower Manhattan when Hurricane Sandy hit NY City in 2012. In addition to people on social media rallying to make sure Nick and his partner were safe, their experience brought national attention to the inadequacy of New York City's disaster preparedness for people with disabilities. NPR's Talk of the Nation devoted a show to the problem. New Mobility magazine wrote about the issue and featured Nick in a 2013 cover story. Instead of a formal obituary, I will let Nick tell his own story. 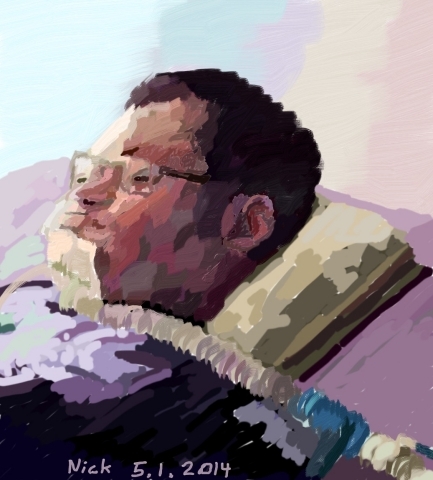 “I’m Nick, a disability rights and Medicaid reform activist, writer, comic creator, painter…. I’ve been advocating for ending the institutional bias and other long-term care reforms for years. I fight especially hard for awareness and action on issues that affect those of us who, like me, have complex care needs and are vent-dependent. We are a vulnerable population that spans multiple diagnoses and every age group, and, to stay in our homes and communities, we need change in long-term care. My primary skill-set is in writing. I come out of the Spring Hill College writing program, where I gravitated toward creative nonfiction and poetry. Though problems maintaining nursing care in the wake of my “victory” in the Medicaid battle prevented me from completing my degree at the Jesuit college, I’ve never stopped writing.